Posted: Tue 02 May, 2017 12:09 pm Post subject: Pikemen! Here it's me! 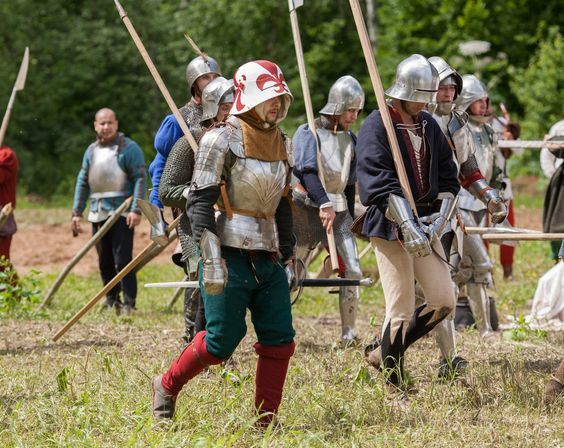 I'm dress as a late 16th/early 17th century pikemen. Beware the armour and helmet are not mine, mine are in their way to arrive. Posted: Tue 09 May, 2017 6:47 am Post subject: Breton squire armor of the Monfort party, around 1350. Breton squire armor of the Monfort party, around 1350. Under the white surcoat, the armor consists of a gambeson, a haubert in flat riveted ring (8mm) and a coat of plate covered with silk. Posted: Tue 09 May, 2017 9:47 am Post subject: Re: Breton squire armor of the Monfort party, around 1350. Awesome kit! also, Do you separate retention chain sewn into your surcoat? Also, why white? I image in would make any dust dirt and stains rather obvious. To Mark C. Moore : Thank you very much, I am working on this new armour project since 3 years to finally realise my perfect kit. To Philip Dyer : Thank you !! I dont understand what do you mean by separating chains. Chains are fixed on the coat of plate an the come through both brass "mamellars" who are fixed to the surcot. Félicitations Pierre ! This armour is incredible. I envy you to have such a set, even if I'm more into the civilian fighting! Pierre, great kit and a very distinctive look. Very nicely done from the spectator side of things! 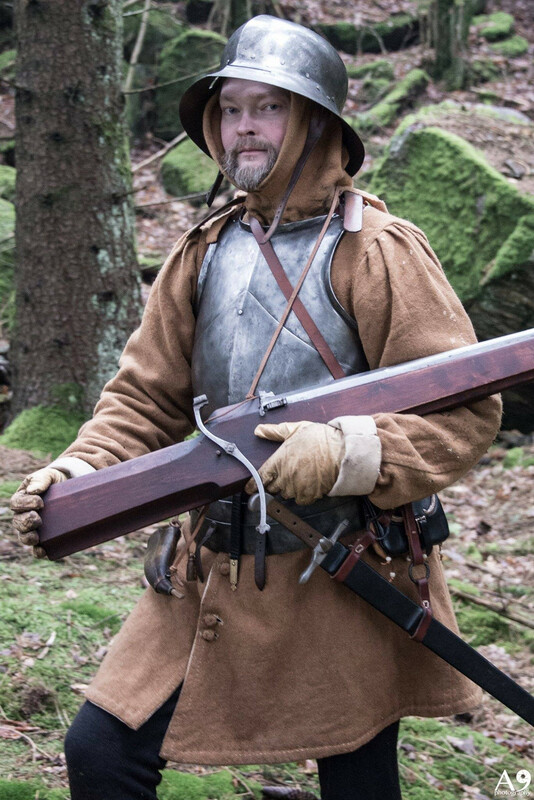 My late 15th century Scandinavian gunner kit. The arquebus has a stock based on a illustration from Martin Merz 1475 "Fireworks book" and an original early 16th century barrel. The armour bits would be on the archaic side in contemporary continental Europe, but the kettle hat and simple export breastplates are shown on illustrations until well into 16th century. Love it. Another great look. Sorry for the poor quality photo. I've gotta get a decent digital camera! Posted: Tue 25 Jul, 2017 8:14 am Post subject: Re: Breton squire armor of the Monfort party, around 1350. So cool, Pierre you look like a 14th century effigy come to life. The chains are a really nice touch. Something a little sillier from me - wearing my armor to Medieval Times Dinner and Tournament! For those of you who don't know, Medieval Times is a dinner show where the performers simulate a tournament while you eat roast chicken off pewter plates. It's super cheesy and all the actors really ham it up but really good fun especially if you drink a lot and you're in good company. The staff got a kick out of a guy showing up in armor and the other guests loved it as well. 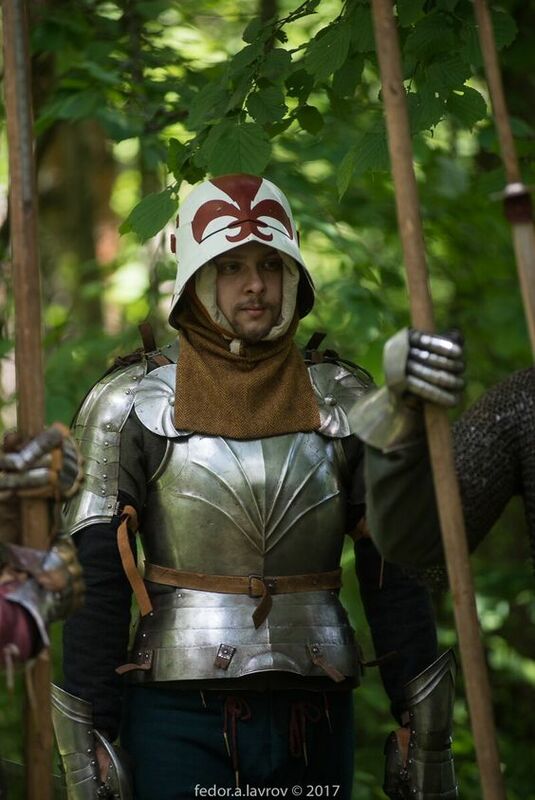 Finally went to the living history event with my new helmet and sword. Concept: light cavalry/infantry in the South German region in 1490-1500. Cuirass is a bit archaic and modelled after round style with divergent ridges pattern. It's a little shabby after a tournament of St.George in Moscow where it lost its tassets. 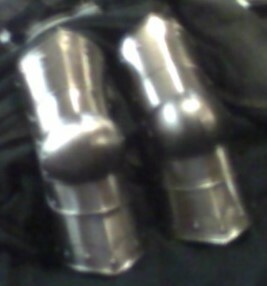 Shoulders and gauntlets based on Churburgh collection and Munich museum analogues. Sword is a replica of Copenhagen style. Always a pleasure to watch this topic and see your stuff and very inspiring kits (honestly I did it for years and it was quite good motivation to mak progress with mine kit). Tjrand's kit is also really nailed the caracter in my oppinion, I rellay like all your posts here, so keep up the good work and congrats! Blaz, I really like your harness also, you have made a really good impression of the gothic style. Vadim, your kit looks good too, the painted sallet is really nice, I like these painted helmets good to see the not mirror polished armour, considering your light cavalry/infantry character. Since last year, when I've posted my kit here, I made just a little progress, but my harness feels more complete. I have now an hourglass style gauntlet with segmented fingers. I've also added some light decorations so it"s more "alive" for example to the helmet or the yellow dagged edge to my CoP. My character's heraldic colors are green and gold (yellow in fabric) it adds some character to it, in my oppinion.